1715: the famed Italian luthier Antonio Stradivari constructs what will become one of his most legendary violins. Among its first owners is Giuseppe Tartini, he of the “Devil’s Trill” Sonata. 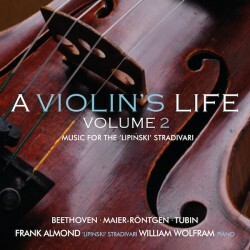 January 2014: Following a concert, walking towards his car, Frank Almond is tasered by an assailant and the “Lipiński” Strad is stolen. An FBI pursuit results in the recovery of the “Lipiński” Strad a few weeks later. International media coverage goes viral, including international TV coverage, a feature in Vanity Fair, NPR, BBC, and much more. 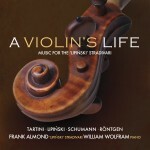 May 2016: Frank Almond releases A Violin Life, Volume 2, featuring more music associated with the “Lipiński” Strad, including works by Beethoven, Amanda Maier-Röntgen and Eduard Tubin, poised to create another classic release. The “Lipiński” Strad lives on.